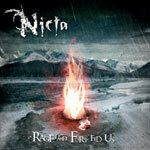 Between August and November 2006 the band recorded the new Mini-CD "Rage and Fury Fed Us", available starting from January 2007, which contains four new songs, four new Nicta-style's Extreme Power cutting blows, longer but more immediate episodes, that underline the continuous increase of the composition's maturity and a natural stylistic evolution due to the experience the band gained with the two previous releases. Alessandro Bonini - www.bonizdesign.com - for the Artwork and Cover Design. Maikel Bononi - Mak on deviantART - for the band photo. Alessandra and Federica for the constant "lifetime" support. Nicola Balliana @ Lizard for technical support. Campo Beer Crew, our friends and each band we've shared the stage with. This Mini-CD is dedicated to Manuel Ferrari. R.I.P. our friend. All music by Graziano Ferracioli & Nuccio Cafà. All lyrics by Fabio Valentini.